Each of the twelve internal voices has been created using our proprietary D-Plane synthesis, and each has been extensively tested and tuned in order to have a broad palette. Every parameter of every voice has its own modulation sequencer, allowing for extensive motion within a pattern. 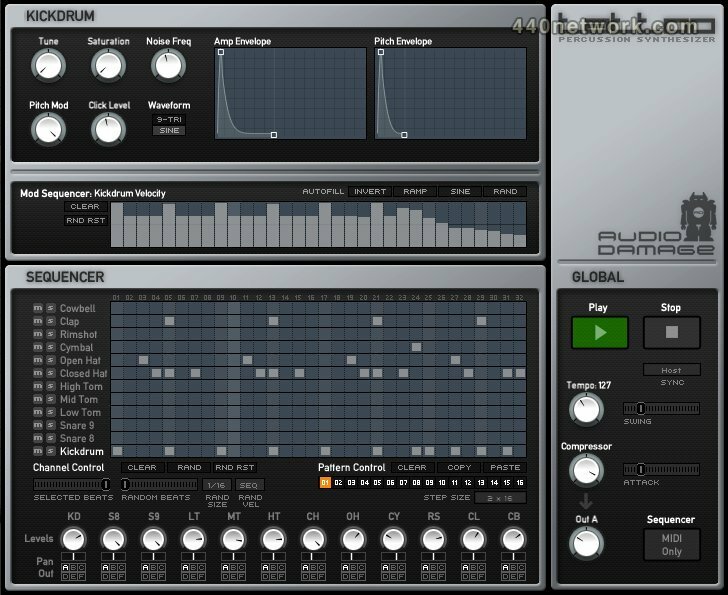 - 12 Drum Synths: Tattoo comes equipped with twelve different voices, utilizing our custom D-Plane synthesis, rather than the one general catch-all voice you find in most drum synth plug-ins. - Sophisticated Step Sequencer: Tattoo's internal sequencer comes correct, taking grid programming to the next level. - Randomization For Days: There are multiple routes to randomizing your beats, from subtle ghost notes to full on haywire. 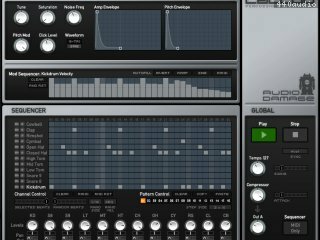 - Parameter Sequencing: Every synth parameter (and we mean every one) has its own sequencer, including randomization. - Synchronized: Tattoo can run off its internal sequencer, from host sync, or via "note sync," where the sequencer can be stepped with MIDI notes. In this way, Tattoo can run in any time signature you can come up with, or sync to any groove template in any host sequencer. - MIDI Input: Tattoo's MIDI implementation includes full MIDI learn for all parameters and MIDI pattern switching. You can also use MIDI note input in addition to or instead of Tattoo's internal sequencer, and still have access to the randomization features and MOD sequencing. - MIDI Output: Tattoo sends MIDI output of all its note events, including randomization, so you can use its step sequencer to drive any other drum synth or sampler (or any instrument, really) as long as your host allows MIDI routing from a plug-in instrument. - Audio Outputs: Tattoo has six stereo outputs. The first buss has a modified version of the Kombinat "One Knob Compressor" to add a little (or a lot of) squish to things. Tattoo is now 32/64 bit on all platforms. Flamming when changing patterns, fixed. The reset note for MIDI Note Sync mode wasn't working correctly, now fixed. Digital distortion from the cymbal sound for some Logic users, fixed. General stability and CPU usage issues addressed.